Built to last and keep you safe doing it, this professional Wrangler Men's Spruce FR3W10S Flame Resistant Lightweight Button-Down Riggs Work Shirt is part of the Wrangler FR family of products. The tough Wrangler brand delivers durability and design to keep you wor ... (see full details) (see specifications) #FR3W10S. Built to last and keep you safe doing it, this professional Wrangler Men's Spruce FR3W10S Flame Resistant Lightweight Button-Down Riggs Work Shirt is part of the Wrangler FR family of products. The tough Wrangler brand delivers durability and design to keep you working strong. 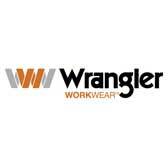 With a reputation that speaks for itself, Wrangler delivers quality workwear you can trust. This professional collared button-front work shirt is made from 6.5-ounce lightweight-yet-durable 88% cotton and 12% nylon FR sateen with Nomex FR thread used in all the garment seams. When it comes to FR workwear, the combination can't be beat for comfort, durability, and protection. It's machine washable at home, following instructions with the garment. This men's top is NFPA 2112 compliant and meets NFPA 70E, ASTM 1506 and OSHA Rule 1910.269 standards. It's rated HRC2, ATPV 9.5 CAL/CM2. When the workdays wear on long and hard, count on this versatile button-front top with a button-down collar that looks great alone or with a tie. The straight back yoke gives you plenty of room to move when you bend and reach on the job. It features a chest pocket that fastens with a button and includes a pencil slot for convenience, and there's a signature Riggs FR logo on the pocket. The sleeve cuff closes with a button, and the placket offers room to roll up your sleeves. An outside Safety Orange ID adds high visibility. The solid color design in Spruce is fresh, yet sleek and professional looking, too. When you need flame-resistant workwear protection, professional style, plus durability and comfort, go with Wrangler Riggs workwear. This Wrangler Men's Spruce FR3W10S Riggs Flame Resistant Lightweight Work Shirt has the features that work for you all day long. I love this Wrangler shirt for welding in. It looks neat but it serves its purpose to help protect arms. Best for 2nd layer of flame resistant, in my work, but looks professional and keeps you warm without being a heavy or stiff shirt. Mine fit as expected and it has held up very well. Wrangler Shirts: Men's Spruce FR3W10S Riggs Flame Resistant Lightweight Work Shirt is being added to your cart.